The anticipation for Jay Rock’s Follow Me Home has been building since the release of his hit single, “All My Life”, well over two years ago. Since his signing with Strange Music, the hip hop community has been watching every move made by the New West MC. Now, with the announcement of Follow Me Home‘s release date and the first look at the cover art, HipHopDX.com has published a short feature on the album. The feature makes mention of Jay’s singles “All My Life” and “No Joke”, as well as the giant line up that includes: Lil Wayne, Tech N9ne, Rick Ross, Game, Chris Brown, Will.i.am, and Busta Rhymes. Follow Me Home drops on July 26. 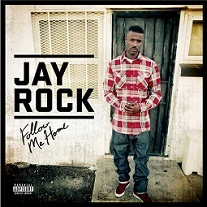 Click here to pre-order Jay Rock’s Follow Me Home.